Gain the knowledge, skills, and mindset to thwart attackers wielding edged weapons. Edged weapons are one of the most common types of weapons used in violent attacks in America, second only to handguns. Knives are easy to carry and conceal, and many of them are legal to own and carry in public places. Krav Maga is the most efficient and effective self defense system in the world, using simple, instinctive movements to rapidly build your survival skills. Our approach to knife defense and disarming attackers is no different. In this 4 hour seminar, you will gain the knowledge, skills, and mindset to thwart an attacker wielding an edged weapon. 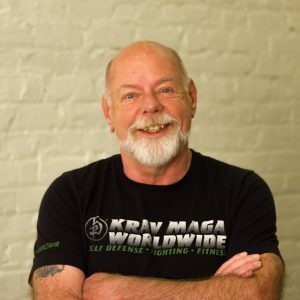 Krav Maga Black Belt and KMSF Owner Barny Foland will take you through common edged weapon attack scenarios, teaching you strong defenses, combatives and safe disarming techniques. Although this seminar is open to all levels, you will get to play with advanced Krav Maga techniques.